I’m sitting here at 8:30 Thursday night, typing up a blog post for Friday morning. That’s practically a miracle around here! I stamped and made stuff most of the evening. . . just shoved the laptop aside, watched the last of my ER DVDs, and played. What fun I had digging up older patterned papers and accessories, and pairing them with Sharon’s sketch and sweet stamps from my new Unity Kit of the Month! I liked this layout so much I made three pretty much the same. . .
and then moved on to make a little love note for my husband, the nurseryman. Happy sigh. Thanks for dropping in! Make sure to visit Cami, Charmaine, Lori, Laurie, and Sharon this morning. They’re sure to have tons of cuteness to share! Stuff: I used misc. Nestabilities to cut out the focal images. Stamps are from Unity’s April Kit of the Month. Cardstock and papers used on birdie cards: Raspberry Fizz from PTI, Whisper White, Yellow is textured cardstock from Bazzil, green stripes are from Stampin’ Up!, and pink with red polkadots is from Scenic Route. The flowers? Layered yellow/white flowers were cut from Hambly Screen Prints paper with my Making Memories Slice Noteworthy cartridge. The other flowers, ribbon slide and buttons are from my stash. Cardstock and papers on the tree card: Making Memories floral and polkadots are both from Making Memories, grid paper is SU!. Ribbon and Button are both from Making Memories. oh…so cute. I love the ‘love you’ card. I had that stamp in hand last night…the ribbon is sweet. have a great weekend. Such sweet, happy cards. 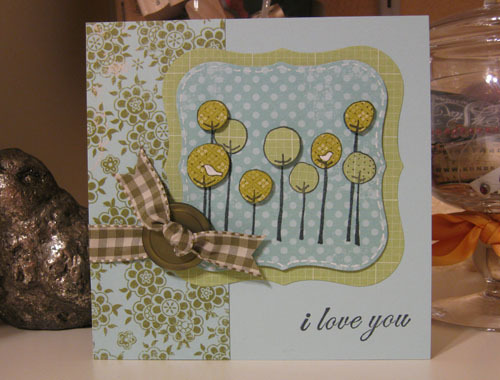 Love your hubby’s card – that brown, gingham ribbon is wonderful. love ur cards, so much color.. love that! Love these cards! Great job! Very bright and pretty first card! The second one…very nice. I love the soft colors…did hubby appreciate it? I LOVE both cards, Jenn! So, so sweet! Have a great weekend! Fabulous cards, all around, Jenn — great job with the sketch! I especially like the blue/green/brown earthy one for Mike — so calming, and what a nice surprise for him! Beautiful colors and cards! Love those paper flowers! Yay!! Love the KOTM and I Love your cards!!! Beautiful Jenn! I love the colors on the first card. Beautiful!! 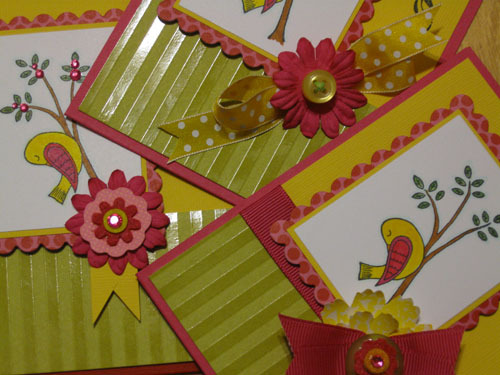 I love the contrast of the bold, bright card creations and the soft, subtle one!! Beautiful, Jenn. I love the color combinations on both! Gorgeous cards Jenn! I love them! Wow Jenn, love the color on the first card…awesome! The second card is wonderful and I hope your hubby likes it! Hey, Jenn, great to see you here on HHH! 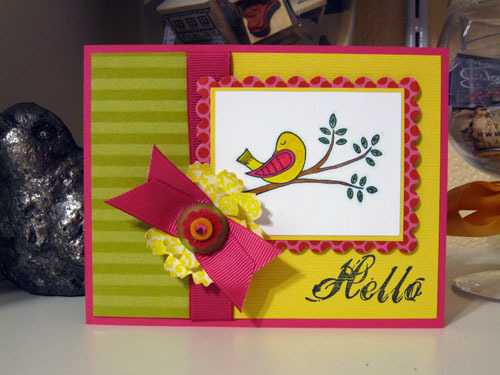 Love the color combos on your first card, so pretty! and the lollipop trees are just darling (it’s my FAVE image from that KOTM). NICE! Beautiful Unity cards – love the colors of the first one and the second one is just so soft and pretty. Dang Jenn… you rocked it last week! YOU GO GIRL! I can’t remember the last time I made multiple cards for fun! LOVE THEM!! Especially Mike’s! I adore both samples you created Jenn.